Up until a few years ago, I had no idea what a coffee bar or coffee station was. I had my coffee mugs stored in my kitchen cabinet. My coffee was kept in the bag in came in, and I stored it in my cabinet. And my coffee maker was one of those with a glass carafe coffee machines. After breaking several of those glass carafes….. don’t ask. 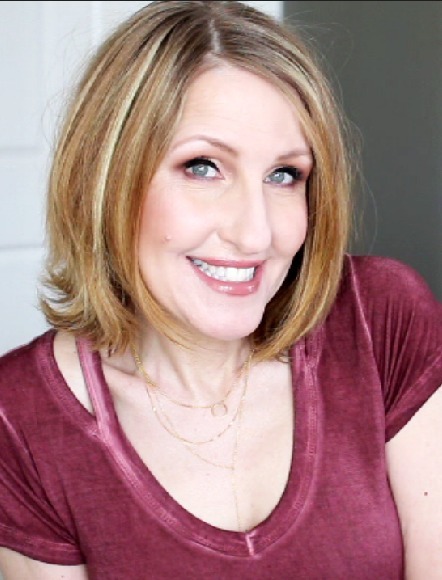 I decided that maybe it was time for a change. So I purchased a new coffee machine that would brew a pot of coffee, but didn’t use a carafe. Sounds perfect right? And every coffee bar needs a good coffee machine, am I right? My new carafe free coffee maker didn’t last long. It stopped making hot coffee and I needed to brew a full pot of coffee just for myself. I started looking into getting a Keurig coffee maker, but I decided against it. And I’ll tell you my personal thoughts. I didn’t like the fact that I had to use coffee pods, that’s seems wasteful and it’s not good for the environment. I also didn’t like a coffee maker AKA brand telling me what coffee to use. Because you have to purchase the pods that work with the machine. So I started to do a little research hoping to find a machine that would brew a great hot cup of coffee, and not a big pot of coffee. I found this coffee maker by icoffee. I never heard of this brand before until I started to research coffee makers. BTW this is not a sponsored post, I’m just sharing my personal experience with this machine. It wasn’t cheap, I paid for it. But it’s so worth the money! 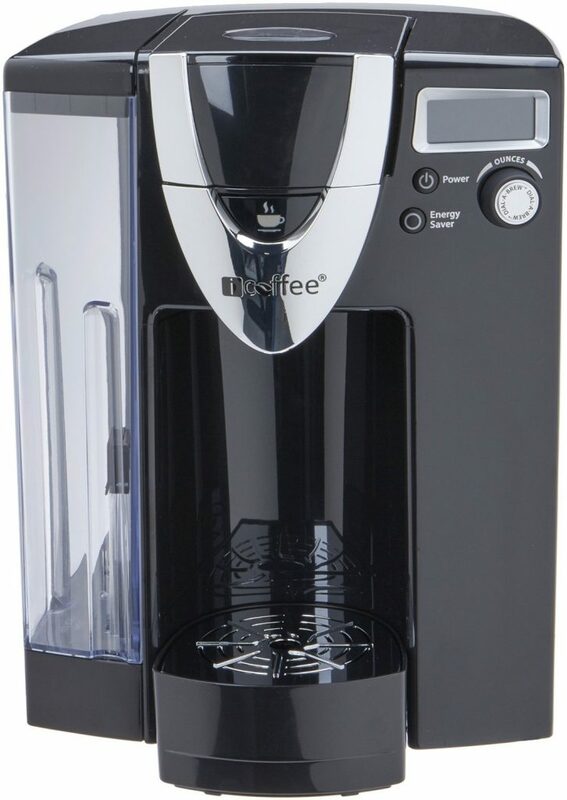 What I liked about this machine besides it brewing hot coffee in a single serve form is that I could purchase reusable pods and use whatever coffee I wanted. I ordered it and let me tell you, I love this machine! It brews a delicious cup of coffee that’s nice and hot. It’s very fast as it takes 30 seconds to heat up and 30 sec to brew. It’s also very quite compared to a Keurig machine. I used one of those while staying at a bed and breakfast this summer. It was very noisy and took several minutes to warm up. All I kept thinking is how much I love my coffee machine at home. The coffee in this machine tastes like it’s been made in a French press. And here’s something more impressive, my husband is now drinking coffee! Shut the front door! Seriously, I’ve been married for 27 years, and I’ve seen him drink 2 cups of coffee in all of our years. But after purchasing this, he decided he wanted a cup of coffee. Now every Sunday he’s drinking a cup with me! For reals! Miracles do happen! 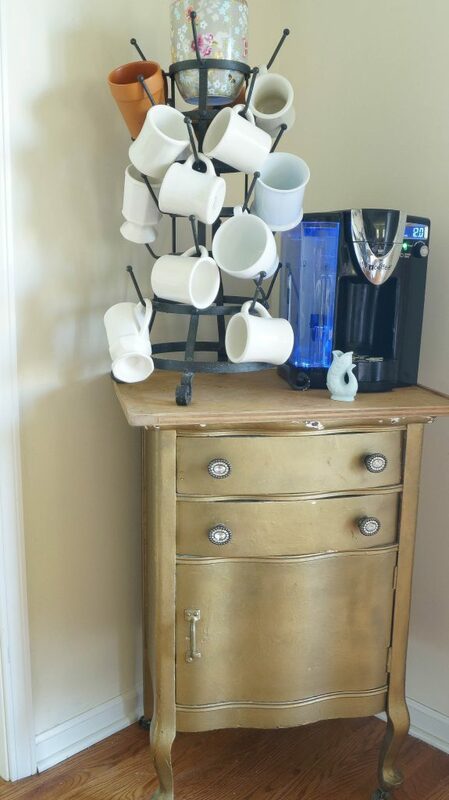 So let’s look at how I set up my coffee bar. This is how I like everything right at my fingertips. So when I wake up in the morning, my coffee is ready to go. My French bottle rack has served me well over the past 3 years for hanging our mugs. 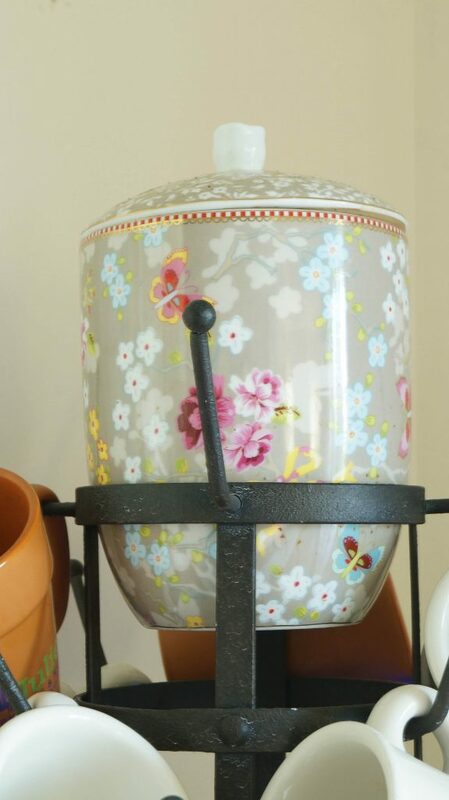 At the top of my bottle rack is my coffee canister. Right now my favorite coffee is Al Johnson’s coffee. I got hooked on this when we visited Door County this summer. It’s a medium roast and it’s delicious. You can say that I’m not a fan of Starbucks. I find it to be too strong and bitter for me. 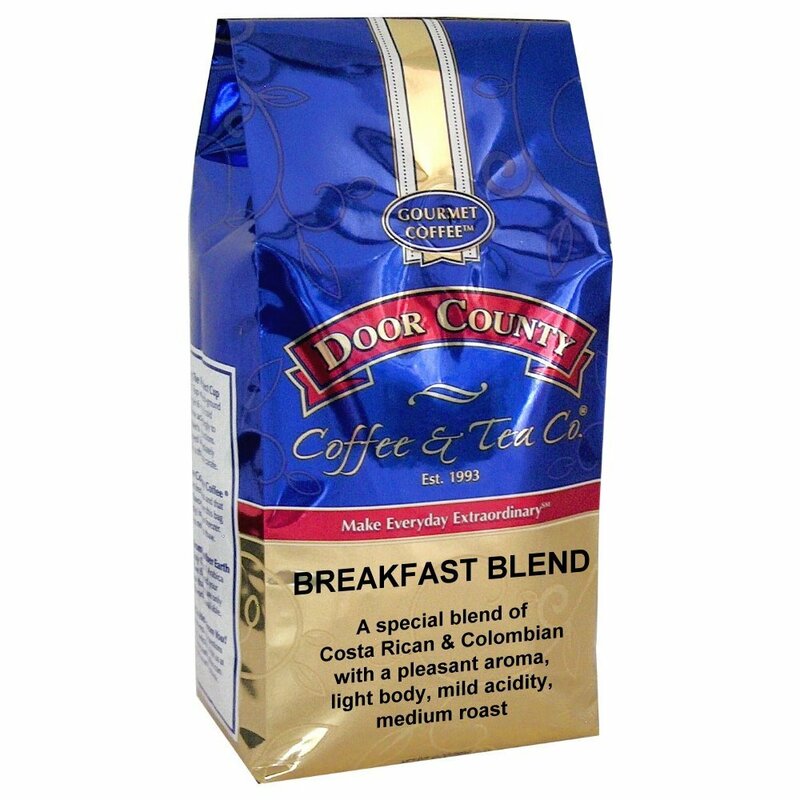 My second favorite brand is Door County coffee. They also have delicious flavors, and flavored coffee is what my husband really enjoys. This little cabinet is nice because it has a drawer so I can also keep tea and hot chocolate for those cold months. Although I don’t drink hot chocolate, I’ll save that for my daughter. My reusable filters are also kept in that drawer. Underneath in the cabinet in my is where I store my extra bags of coffee. Oh, if I wanted to use those coffee pods I could because you can use any brand of pod in this machine. And I guess if I were having a party I’d have to do that because I wouldn’t have time to rinse out the reusable filters each time someone wanted a cup of coffee. But it works great on a daily basis. And using this filter saves us lots of money. Keep mugs on hand. 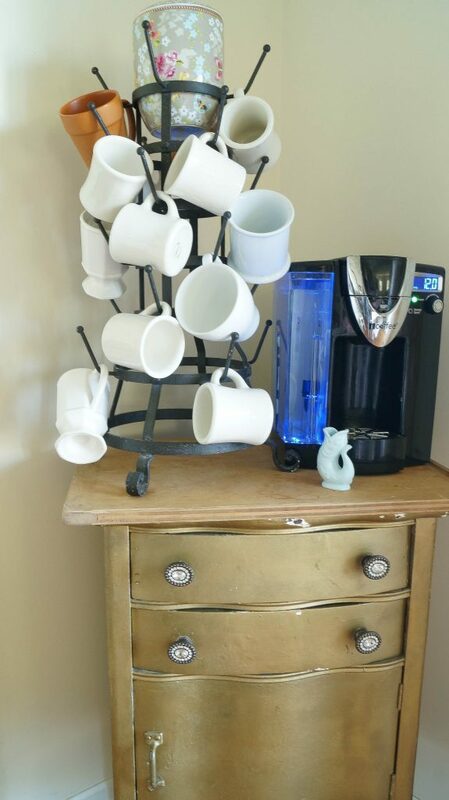 If you don’t have space for a cabinet, use a tray for your machine, and stack cups next to your machine. Store your coffee in an airtight container. Make sure to keep tea and hot chocolate near your machine. If you enjoy using creamer in your coffee, but you don’t want to use stir sticks or spoons to mix up the cream. Add your coffee creamer to your mug first then add your coffee. The cream will mix just by adding the coffee, and it tastes delicious. You can see that my coffee bar is nothing fancy. And you’re coffee bar doesn’t have to be fancy either. Get creative and use what you already have. Are you a coffee or tea drinker? 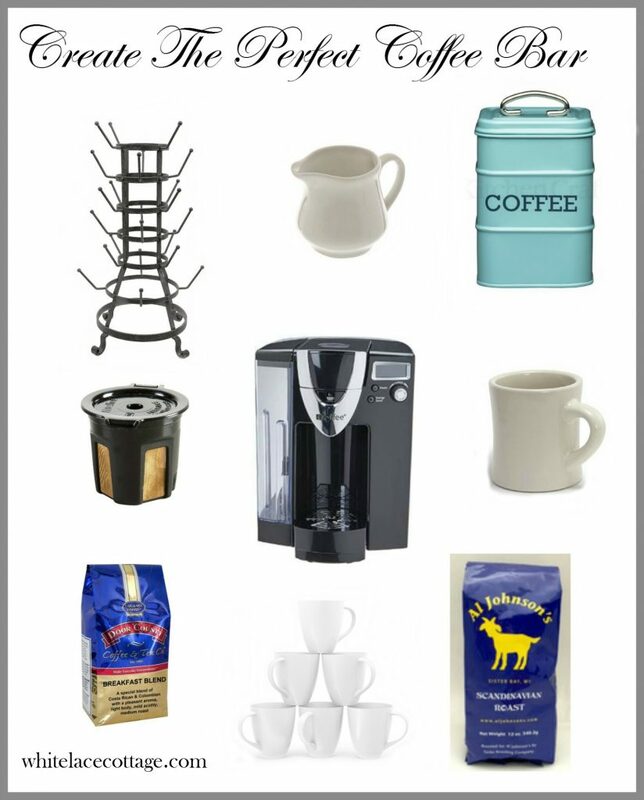 Do you have a coffee bar set up in your kitchen? Wow i feel the same way about all those little dispensers what a mess. I will have to look in to buying one of those icoffee’s. I am leaving to go to Ireland so you won’t hear from me for a couple of weeks and i love your little coffee bar,what a pretty little cabinet. Thanks Anne. My husband and I have been coffee drinkers from way back. 2 pots each day–morning and evening. Our coffee bar is nothing fancy either, just the way we like it. Although in the winter I do set up a hot chocolate bar!